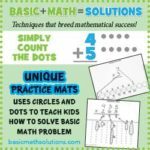 Basic Math Solutions™ is a system of teaching and learning math developed by Mr. Richard Garcia, a Special Ed teacher who thought about math struggles his students go through . . . and thought about it . . . and thought about it . . . and then came up with a realization – he came to understand basic math for the first time in his life. Mr. Garcia did this by drawing circles with dots inside of them as examples of multiplication for his students. In essence, Richard taught his students how to count. Simple, but meaningful. By showing real-world examples of previously abstract concepts, his Special Ed. students began to be able to do math like the general education students did. He concentrated on having his kids do math rather than understand facts about math. Just do it. Simple. But he also believed that by doing math, his kids would absorb the knowledge about math facts as a consequence, which they did – and still do. By giving his students the real-world connection to math concepts, used in Basic Math Solutions™ rather than having them try to memorize abstractions, he has given them the ability to solve problems outside of his classroom for all time. In other words, he has empowered them — he has taught them how to fish, rather than simply giving them a fish. Richard’s approach also prepares his students’ brains for receiving math facts. This makes math enjoyable to learn and to teach, so everyone succeeds! Mr. Garcia has developed a full line of math teaching products using his Basic Math Solutions™ system. There are 11 Activity Mats covering Beginning Addition through Long and Short Division and “everything” in between. The Beginning Addition Mat on one side, show boxes that are numbered 1 to 10; the student places manipulatives such as beans, macaroni, etc., in two large boxes on the bottom of the Mat. Then they place the objects in the 10 boxes to see the connection between the number symbol and the number of objects. On the reverse side of the Mat, are addition problems using dots and numbers to show the student how addition actually works with real-world objects and number symbols. Richard also offers four Workbooks entitled “Math Is Not a Problem” that provide exercises for Basic Addition through Multiplication. Before your child can experience a problem with math, give Mr. Garcia’s Basic Math Solutions™ products some time at his website, and make math an enjoyable subject for all time! E.S.